Beriev Be-2 seen in Wings of Russia. 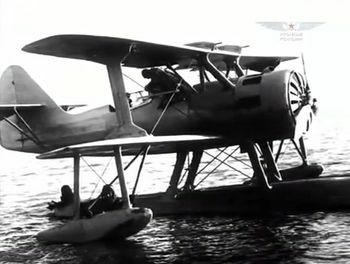 The Beriev Be-2 (originally designated KOR-1) was a two-seat reconnaissance seaplane built for the Soviet Navy shortly before World War II. It was designed to replace the Navy's obsolete license-produced Heinkel He 55 aircraft operating from warships and shore bases. This page contains all films, TV series, and video games that feature the Beriev Be-2. Pages in category "Beriev Be-2"
This page was last modified on 29 March 2019, at 01:17.